Homemade cannelloni pasta is not hard to make. 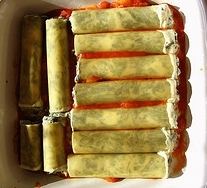 I will give you step-by-step instructions and before you know it, you will be known as the "Cannelloni Queen." Divide pasta dough into 6 parts. Roll each part into a 9 or 10 inch square; the thinner, the better. Divide each square into 4 smaller squares. Cook in a 6 or 8 quart pot of boiling salted water for 3 minutes. Drain in colander and run under cold water. Drain on a clean towel. Place 2 tablespoons of homemade filling on each square and roll up. Put seam side down in the baking pan. Add 1/4 inch of hot water to the pan and cover the pasta with tomato sauce. Sprinkle with grated Romano cheese. Cover firmly with foil and bake for 1 hour. Remove the foil and sprinkle with shredded cheese. Bake uncovered for 10 minutes more or until the cheese is melted. If desired, top with additional sauce.